See South Australia year to date financial results here. For more information on the Local Buying Program in South Australia please contact your local C-Res Business Engagement Advisor, Lauren Crighton, via email lauren.crighton@c-res.com.au or visit our website. C-Res and BHP’s Olympic Dam have set the standard of excellence for working with local businesses and communities after receiving recognition at the SA Premier’s Awards gala evening. C-Res is a cost neutral entity and partners with BHP to deliver the Local Buying Program (LBP) in South Australia. The 2018 Awards event recognized excellence demonstrated by leading resources and energy sector companies and organisations in the areas of diversity, working with communities and innovation. Both companies celebrated being named winners of the METS Excellence in Working with Communities category at the recent Premier’s Awards Energy and Mining. This award category celebrated C-Res and BHP accomplishments and dedication to supporting the local community in South Australia through the Local Buying Program. Image: LEFT: Nathan Flaman (Head of Supply, BHP Olympic Dam), Tracey Cuttriss-Smith (CEO, C-Res) and Hon Tim Whetstone MP (Minister for Primary Industries and Regional Development). RIGHT: Tracey Cuttriss-Smith (CEO, C-Res), Steven Marshall (Premier, SA) and Nathan Flaman (Head of Supply, BHP Olympic Dam). 2018 marked the 30th Anniversary for Olympic Dam and Roxby Downs. To celebrate and acknowledge the resilience and diversity of local businesses who have survived and prospered, a gala evening was held on Friday 19 October 2018. This event was hosted by the Roxby Downs Business Forum, with C-Res being a proud sponsor of the event. The Roxby Downs Business Longevity Awards 2018 were open to businesses with a physical address within Roxby Downs or Olympic Dam and have traded for a consecutive period of 10, 15, 20, 25 or 30 years. The evening was a great success with over 30 businesses nominated for awards. Some of the award winners were also Local Buying Program Suppliers. Congratulations to all the businesses that received an award for this significant achievement! Image: Karen Wegner (Admin, Roxby Hardware), Dalene Vosser (Director, By Grace Bookkeeping) and Deon Vosser (Director, Just Hire OD). A Local Buying Program training session was run today, 31 January, at the PAT Centre at Olympic Dam to assist BHP employees with any LBP questions. Training sessions are ideal for BHP employees who are interested in learning more about the Local Buying Program, and a great opportunity to meet C-Res Business Engagement Advisor, Lauren Crighton. 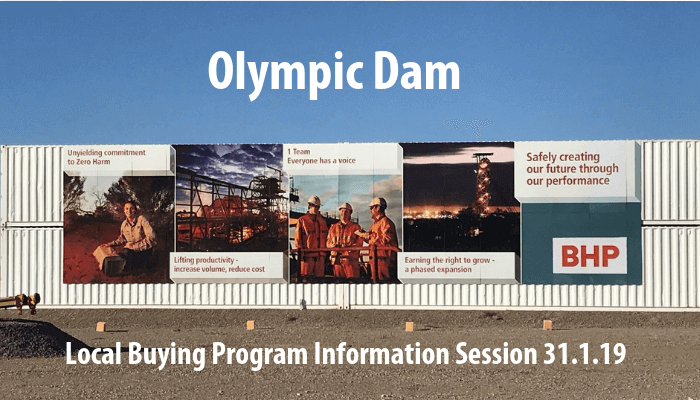 The intent of the training session is to raise awareness and boost the visibility of the Local Buying Program across Olympic Dam operations by providing training and information to our BHP buyers. Register your interest today in running a training session, in a group or individually, by contacting Lauren, SA LBP Business Engagement Advisor via email lauren.crighton@c-res.com.au to find out more about using the Local Buying Program and how it is supporting our local business community. Olympic Dam HSE department sourced a supplier to assist with an annual Skin Screening program on site to encourage team members to have their skin checked for potentially dangerous lesions. The Local Buying Program was used to procure the required medical services through Roxby Downs Family Practice to run a ‘clinic’ for skin checks. Roxby Downs Family Practice is a local GP and medical centre, dedicated to the health and wellbeing of the Roxby Downs community. The benefits of this program included promoting the health of Olympic Dam employees and contractors by providing a free skin health check, and the provision of this specialised service by a local supplier engaged through the Local Buying Program. Image: Dr Simon Lockwood (Roxby Downs Family Practice). This is a FREE, 15 hours per week Skills for Education and Employment (SEE) program designed to develop skills and knowledge in Information Technology (IT) and improve literacy and numeracy skills. This course will be held at Port Pirie TAFE SA. For more information or how to enroll, please contact: Jacinta Huxtable | 8821 0400 or Sheree Jamieson | 8821 0427. Attend in person or via online webinar. Being educated about the process, risks and understanding the requirements of operating in a foreign market can highly increase the chance of success in exporting overseas. This free information session presented by TradeStart will provide some useful information including details of the SA Export Accelerator Program.